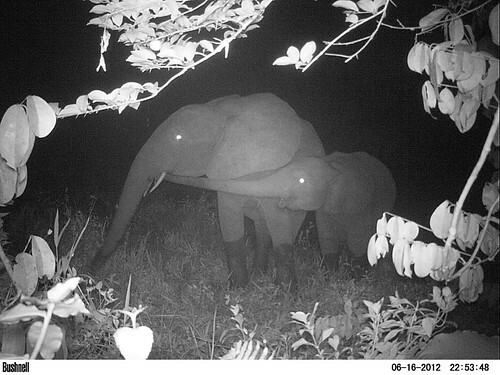 Elephants with muddy knees amble by night around a clearing in the northern TL2 forest. In late March Maurice, our senior field leader, took eight cameras and a supply of rechargeable batteries to our northern base camp, Obenge. He experimented with different ways of hiding, attaching and aiming the cameras. He is thrilled – and so are we! John and Pablo watch as Maurice downloads camera trap photos. The camera is visible on the treelet behind them. Maurice used the small mineral lick called Musubuku, hoping to find out how often different animals visited. During the day we never see animals; their tracks leave only an imprecise record of their nocturnal visits. Maurice set cameras with an infrared light beam as a detector. The infrared flash does not emit visible light, but captures the image in the dark of night without being detected by most animals. 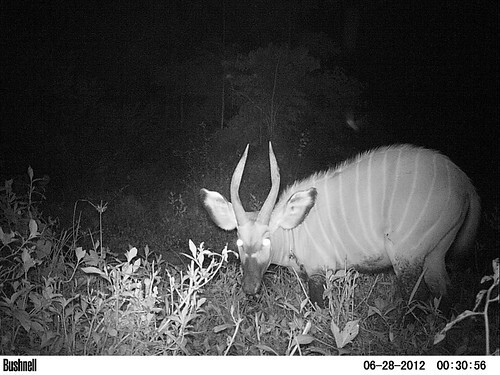 A young adult male bongo visited Musubuku every few nights. A group of four buffalo were also regular repeat visitors. The elephants, whose photo is above, visited the clearling for a few successive nights and then were gone. 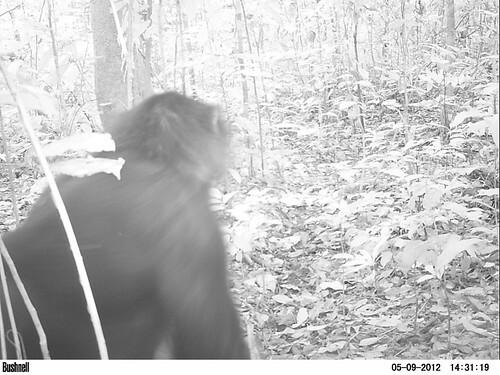 A bonobo with his back to the camera at Losekola. Many of the photos, like this one, were taken with infrared NOT because it was night, but because of low sub-canopy light levels. 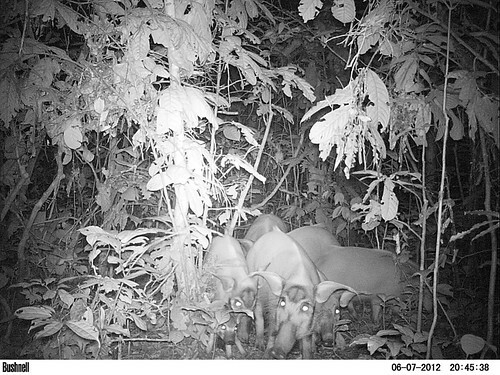 Six red river hogs moving in a tight sounder or group along a path. 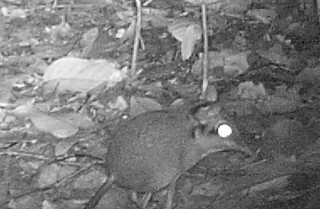 The diminutive four-toed elephant shrew is in the lower right corner. 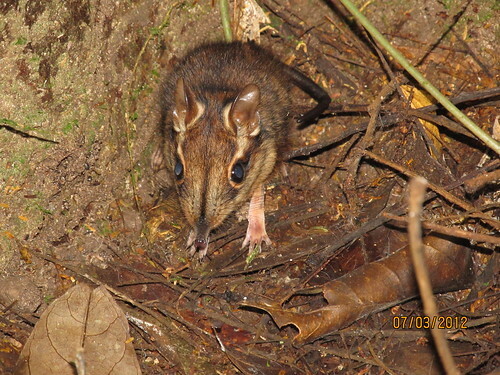 Up close, a very active creature of the forest floor. Captured as the sun streamed through the canopy, this camera trap photo of a Blue Duiker is in the full color of visible light. Our presence has kept most hunters from using the Losekola forest, but our cameras “captured” one poacher, Nova. The village had agreed to protect our studysite, so the chief of Obenge confiscated Nova’s unregistered shotgun after Maurice showed the photo below. Nova (above) was caught “red-handed” hunting in the Losekola study area. 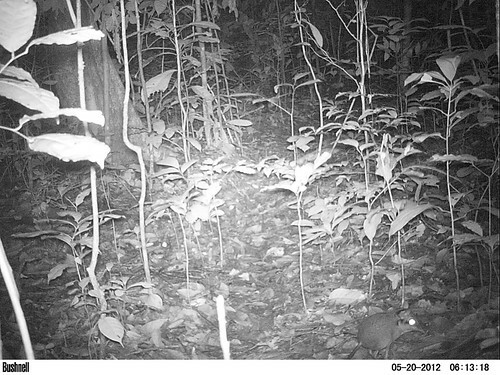 This shows that camera traps, developed from surveillance cameras such as those in stores and banks, can still be used for that original purpose in the TL2 forests. And it goes both ways: people (like Nova above) stealing from the forest and the forest (in this case, a leopard) stealing from people. There was a leopard hanging around near the village of Obenge, stealing chickens and goats. 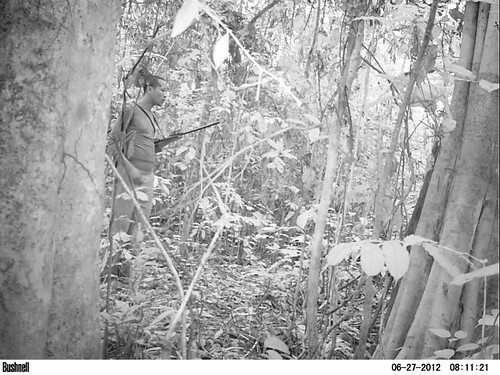 Maurice wondered if he could capture it on a camera trap– and he did – “red handed” or “red jawed” with a chicken in his teeth. The leopard prowls along the edge of our project compound in Obenge; with a feathery snack already nabbed. This entry was written by Terese Hart, posted on 2012-08-08 at 8:28 pm, filed under Guides and how to, The Forest. Bookmark the permalink. Follow any comments here with the RSS feed for this post. Post a comment or leave a trackback: Trackback URL. Well done !!!! This is really an incredible report and so very exciting. I was up your way with Bob while he was recovering from surgery. Sorry to have missed you. good visit to our school in Kenya, 500 plus students. I saw my one and only Bongo in 1979 at the Ark in Kenya. 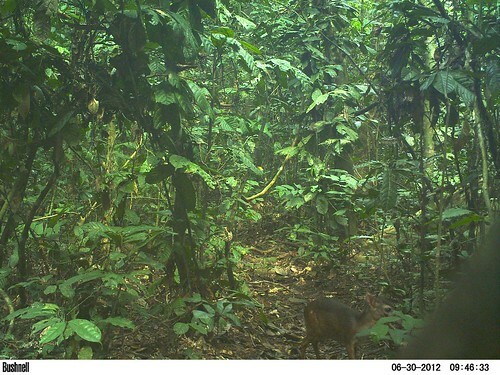 The camera trap show that that this forest is still surprisingly rich. 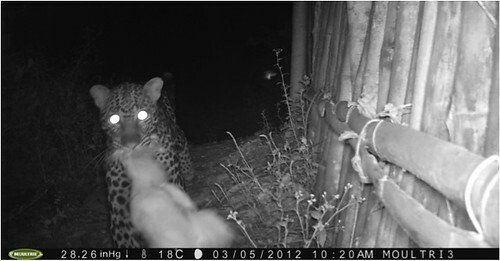 I like camera traps (for instance a tiger 4000 m asl high in the himalaya was discovered ). I agree there is still a richness of animals in the TL2. Cryptic, yes, and not everywhere. 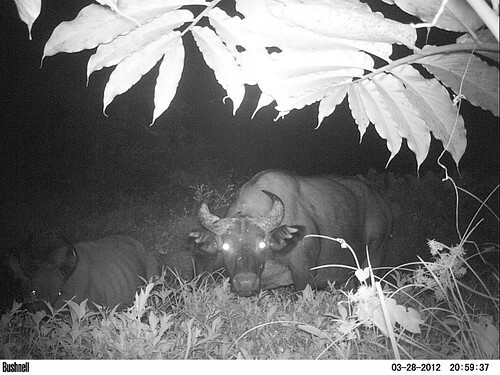 But the camera traps will help us determine what is where….And provide surprises as well, as you point out in your mention of the discovery of the tiger at 4000m. Exciting way of identifying both conservation values and threats! Congratulations. Red River Hogs are cute, but if you get a Giant Forest Hog, I’ll pay the next tournée! Thank you Jean Pierre. 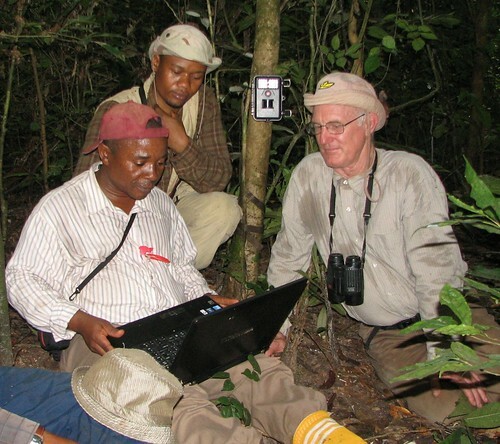 We will be on the lookout for your beloved Hylochère, but I dont think they are known to occur in the Congo’s left bank forests…But as we are finding in the TL2, there are surprises. So if there is anything that comes up on the cameras, we’ll be sending the photos to you for confirmation…And it would be delightful to have you on that next tournée. Would you, Terese or John, share an individual email address to which I can send some info. We enjoyed a wonderful 4 days in Epulu in May of 2009 and are deeply saddened by the recent tragedies there. As usual, Terry,you come up with wonderful sights and I hope that it continues to go well for you on the Lomami . I love seeing what you send and I send you guys my love -and-some money.